You know the drill. It happens in just about every episode of The Mighty Morphin’ Power Rangers. Rita Repulsa (or sometimes Lord Zedd) will create some kind of monster that threatens Angel Grove. The Rangers will fight against some Putty Patrollers before taking on the main baddie, who grows to a ridiculous size. Then, the Power Rangers will hop into their Dinozords to duke it out with the monster until they realize that normal Dinozords won’t work. Only the Megazord will be enough to finish off their foe! We just have one question. Why don’t they just start it out in the Megazord? The regular Dinozords almost never work, so why don’t they just skip to the Zord that gets the best results? In fact, they could save a lot of time by just summoning the Megazord the second the Putty Patrollers show up. We bet that a squad of Putter Patrollers would be completely unable to put up a fight against a 100-meter fighting robot! The good news is that you don’t have to mess around with regular Zords. You can skip straight to the Megazord when you wear this officially licensed Power Rangers costume. 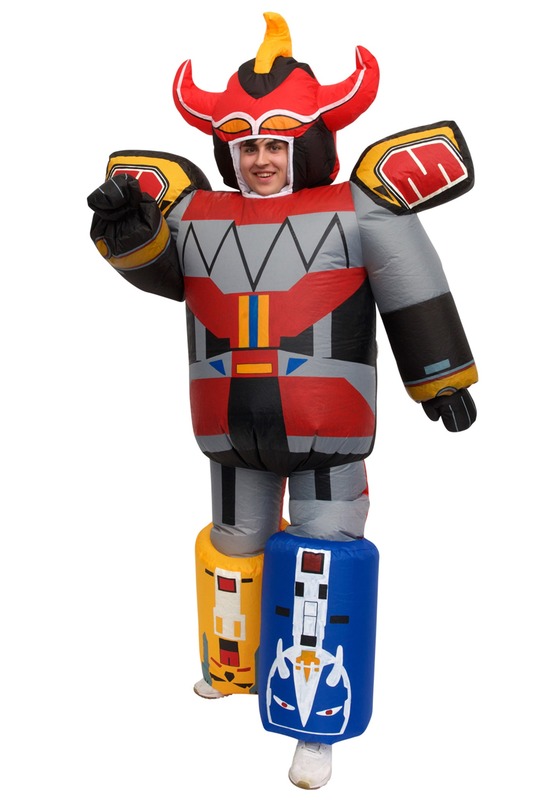 This Megazord costume is the easiest way to do battle with the baddies! It’s an inflatable costume and comes with an inflatable jumpsuit. The exterior of the jumpsuit has the various Dinozords printed on it. The suit also has an attached fan, which inflates the costume as you wear it! Just turn the switch on and watch it blow up! When you’re ready to stop messing around with Putty Patrollers, make sure to get this Power Rangers Megazord costume. Be on the lookout for Lord Zedd’s monsters though! They’ll be looking to pick a fight with you as soon as you step foot in this costume.